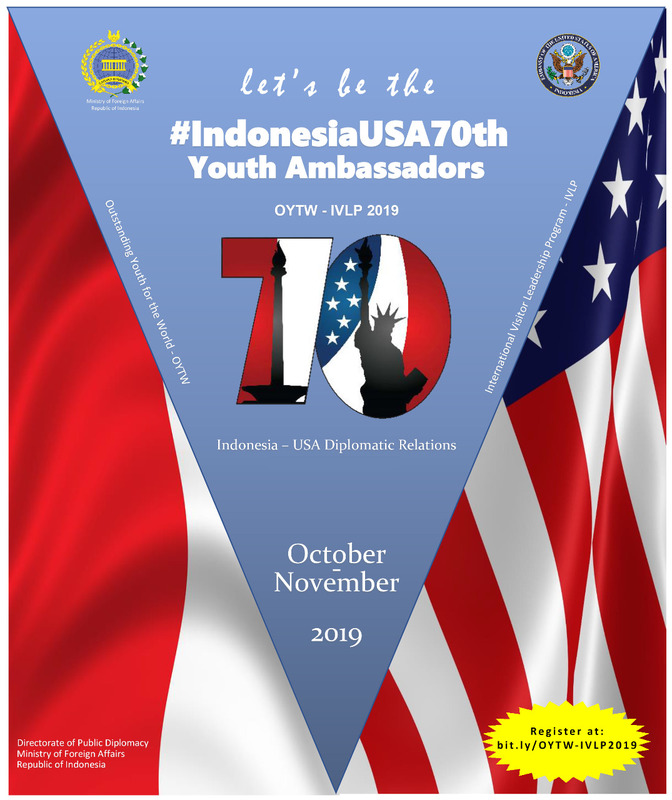 #IndonesiaUSA70th Youth Ambassadors is a collaborative program between Outstanding Youth for the World (OYTW) from the Government of Indonesia and the International Visitor Leadership Program (IVLP) from the United States Government. OYTW has been held by the Ministry of Foreign Affairs since 2011, by sending Indonesian young people who excel abroad, in order to expand networks and insights. Countries that have been visited are, the United States, Japan, Britain, Canada, Hong Kong, India, Australia, so that the implementation of OYTW 2019 to the United States is the eighth time. IVLP is the main professional exchange program that has been held by the Department of State (DoS) since 1940. Through a short visit to the United States, participants will discuss directly with counterparts. Indonesia has participated in the IVLP program since 1952. The participants will travel for 3 (three) weeks to several cities in the United States in October - November 2019, where they will meet with government officials, professionals, religious leaders, academics and ethnic groups, to experience first hand American culture and social life. . Participants will be accompanied by project liaison during the activity. Introducing educational institutions in the United States, including the youth movement and innovators. Registration Form can be downloaded HERE, please fill it correctly and sign it. Essay with the theme "70 Years Indonesia-USA Diplomatic Relations; What's Next? " Close up size photos and entire body, with a maximum size of 1 Mb each. A copy of the Student ID that is still valid. Vlog with the theme "Why should I be chosen as # Indonesia US 70th Youth Ambassador?" Documents in Numbers 1, 2, 3 and 4 can be sent to e-mail at oytw2019@kemlu.go.id, while for Number 5, simply include the YouTube link on Registration Form.